A courtesy title is a form of address in systems of nobility used for children, former wives and other close relatives of a peer, as well as certain officials such as some judges and members of the Scottish gentry. These styles are used 'by courtesy' in the sense that the relatives, officials and others do not themselves hold substantive titles. There are several different kinds of courtesy titles in the British peerage. If a peer of one of the top three ranks of the peerage (a duke, marquess or earl) has more than one title, his eldest son - himself not a peer - may use one of his father's lesser titles "by courtesy". However, the father continues to be the substantive holder of the peerage title, and the son is only using the title by courtesy, unless issued a writ of acceleration. If the eldest son of a duke or marquess has an eldest son, he may use a still lower title, if one exists. In legal documents the courtesy title is implied but not used directly, e.g. the name of the person is given then "commonly called [title]". For example, the Duke of Norfolk is also Earl of Arundel and Baron Maltravers. His eldest son is therefore styled "Earl of Arundel" (without the definite article "The" which indicates a substantive title). Lord Arundel's eldest son (should he have one during his father's lifetime) would be styled "Lord Maltravers". However, only The Duke of Norfolk is actually a peer; his son Lord Arundel and his hypothetical grandson Lord Maltravers are not. Courtesy titles are only used by the peer's eldest living son, and the eldest son's eldest living son, and so forth. Other descendants are not permitted to use the peer's subsidiary titles. Only the heir apparent (and heir apparent to the heir apparent, and so on) may use them. An heir presumptive (e.g., a brother, nephew, or cousin) does not use a courtesy title. However, Scottish practice allows the style Master/Mistress of X to an heir presumptive as well as to an heir apparent; for example, the brother of the present Marquess of Tweeddale has the title Master of Tweeddale. Wives are entitled to use the feminine form of their husbands' courtesy titles. Thus, the wife of an Earl of Arundel would be styled "Countess of Arundel" (again, without the article). Holders of courtesy titles do not, at the Court of St James's, have their title preceded by the definite article "The" (which is always written with the capital letter "T"): e.g., 'Earl of Arundel' rather than 'The Earl of Arundel'. The actual courtesy title which is used is a matter of family tradition. For instance, the eldest son of The Duke of Buccleuch and Queensberry is styled "Earl of Dalkeith", even though the duke is also The Marquess of Dumfriesshire, a title which outranks the earldom. Similarly, the eldest son of The Marquess of Londonderry is styled "Viscount Castlereagh", even though the marquess is also The Earl Vane. Titles with the same name as a peer's main title are not used as courtesy titles. For instance, The Duke of Westminster is also The Marquess of Westminster and The Earl Grosvenor (amongst other titles). 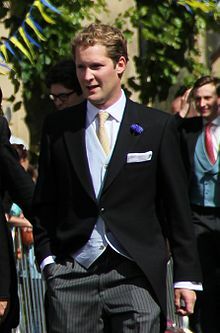 The duke's eldest son is not styled "Marquess of Westminster" (which would cause confusion between the son and the father), and so is styled "Earl Grosvenor" instead. The title used does not have to be exactly equivalent to the actual peerage. For example, the eldest son of The Duke of Wellington is usually styled "Marquess of Douro", although the actual peerage possessed by his father is Marquess Douro (not of Douro). If a peer of the rank of earl or above does not have any subsidiary titles of a name different from his main title, his eldest son usually uses an invented courtesy title of "Lord [Surname]". For instance, the eldest son of The Earl of Devon is styled "Lord Courtenay", even though the Earl has no barony of that name; similarly, the eldest son of The Earl of Guilford is styled "Lord North". The eldest son of The Earl of Huntingdon, who has no subsidiary titles, is styled "Viscount Hastings" to avoid confusion with The Lord Hastings, a substantive peer. The heir of The Earl Castle Stewart uses the style "Viscount Stewart" in order to avoid confusion with Lord Stewart, the eldest son of Viscount Castlereagh (the eldest son of The Marquess of Londonderry). Another form of courtesy title is the honorific prefix of "Lord" before the name. This non-peerage title is accorded to younger sons of dukes and marquesses. The courtesy title is added before the person's given name and surname, as in the example of Lord Randolph Churchill, although conversational usage drops the surname on secondary reference. The title persists after the death of the holder's father, but is not inherited by any of his children. The wife of the holder is entitled to the feminine form of her husband's title, which takes the form of "Lady", followed by her husband's given name and surname, as in the example of Lady Randolph Churchill. The holder is addressed as "Lord Randolph" and his wife as "Lady Randolph". The honorific prefix of "Lady" is used for the daughters of dukes, marquesses and earls. The courtesy title is added before the person's given name, as in the example Lady Diana Spencer. Because it is merely a courtesy with no legal implications, the honorific persists after the death of the holder's father but it is not inherited by her children. The spouse of a woman with an honorific title does not hold any courtesy title in right of their spouse. Neither does the husband of a woman or man with any title (including the husband of a peer). The younger sons of earls, along with all sons and daughters of viscounts, barons and lords of parliament are accorded the courtesy style of "The Honourable" before their name. This is usually abbreviated to "The Hon." The title persists after the death of the holder's father, but it may not be inherited by the holder's children. It is used only in third person reference, not in speaking to the person. The daughter of a duke, marquess, or earl who marries an untitled man becomes "Lady [Given name] [Husband's surname]". The daughter of a viscount or baron who marries a commoner is styled "The Honourable [Given name] [Husband's surname]" (the given name is dropped and Mrs is substituted if the husband's right to the style derives from office or appointment rather than from ancestral peerage). Any woman who marries a peer uses the feminine version of his peerage title, even if her own precedence is higher than his, as in the case of a duke's daughter marrying a baron, because a peerage is a substantive title, the usage of which is preferred to any courtesy style - unless she marries into the Royal Family. If a woman marries the younger son of a duke or marquess, she becomes "Lady [Husband's given name] [Husband's surname]." If she marries the younger son of an earl, viscount or baron, she becomes "The Hon. Mrs [Husband's given name] [Husband's surname]." In case of a divorce, she may keep the same style as during marriage or she may choose to assume the style "Mrs [Given name] [Husband's surname]." Regardless of what she chooses, she loses all precedence acquired from marriage and because of the former option, there can be multiple Lady John Smiths. Until 2004, children who had been adopted by peers had no right to any courtesy title. Pursuant to a Royal Warrant dated 30 April 2004, these children are now automatically entitled to the same styles and courtesy titles as their siblings. However, unlike biological children, they cannot inherit peerages from their parent (and thus, since they cannot be heirs, if a peer adopts a son and he is the oldest son, he would use the styles of younger sons). For example, actress Nimmy March, the daughter of The Duke and Duchess of Richmond, was immediately elevated to Lady Naomi Gordon-Lennox on 30 April 2004. Note that Scottish peerages' rules for courtesy titles and styles differ. Occasionally, a peer succeeds to a peerage upon the death of a relative who is not one of his or her parents. When this happens, the relatives of the new peer may be allowed to use the courtesy titles or styles which would have been accorded them if the new peer had succeeded a parent or grandparent in the title. For instance, Rupert Ponsonby, 7th Baron de Mauley, succeeded his uncle in 2002. His brother George had no title, as their father was only the younger son of a peer and was never actually Baron de Mauley. However, in 2003, George was granted, by Warrant of Precedence from Queen Elizabeth II, the style and precedence that would have been his, had his father survived to inherit the barony, becoming The Honourable George Ponsonby. Precedence in such circumstances is usually granted but is not automatic. The wife of a substantive peer is legally entitled to the privileges of peerage: she is said to have a "life estate" in her husband's dignity. Thus a duke's wife is titled a "duchess", a marquess's wife a "marchioness", an earl's wife a "countess", a viscount's wife a "viscountess" and a baron's wife a "baroness". Despite being referred to as a "peeress", she is not a peer in her own right: this is a 'style' and not a substantive title. However, this is considered a legal title, unlike the social titles of a peer's children. The wives of eldest sons of peers hold their titles on the same basis as their husbands, i.e. by courtesy. Thus the wife of the Marquess of Douro is known as the "Marchioness of Douro". In the case of a woman who is a substantive peer in her own right, by succession or by first creation (i.e. ennoblement, most commonly in recent times under the Life Peerages Act 1958), her husband acquires no distinction in right of his wife. Thus, the husband of The Baroness Bottomley of Nettlestone has no courtesy title; he was simply called "Mr Peter Bottomley" until he was knighted and became "Sir Peter Bottomley". In 2013, there was a private member's bill in the House of Lords to allow the spouse of a woman who holds an honour, if he or she enters civil partnership or marriage, to assume the title The Honourable. This bill stalled, and was not passed by the end of the Parliament. If a prince or peer dies, his wife's style does not change unless the new peer is a married man (or a woman, if the succession permits); traditionally the widowed peeress puts "Dowager" in her style, i.e. "The Most Hon. The Marchioness of London" becomes "The Most Hon. The Dowager Marchioness of London." If a widowed peeress's son predeceases her, her daughter-in-law does not use the title of Dowager, but is styled, e.g. "The Most Hon. Mary, Marchioness of London", until her mother-in-law dies, at which point she may use the title of "Dowager Marchioness". In more recent times, some widows choose to be styled with their Christian names, instead of as Dowager, e.g. "Olave, Lady Baden-Powell" ("Lady Olave Baden-Powell" would incorrectly imply she was the daughter of a duke, marquess or earl). It used to be customary for women with higher titles from one marriage to retain them even on subsequent remarriage. As Lord Macnaughten put it in the case of Earl Cowley v Countess Cowley  AC 450: "...everybody knows that it is a very common practice for peeresses (not being peeresses in their own right) after marrying commoners to retain the title lost by such marriage. It is not a matter of right. It is merely a matter of courtesy, and allowed by the usages of society." The divorce court, in the above case, granted the earl an injunction preventing his former wife from using his title; however this was overturned by the Court of Appeal, whose decision was confirmed by the House of Lords, on the grounds that ordinary courts of law lacked any jurisdiction in matters of honour. The same practice was followed by widows who remarried. A prominent example was Catherine Parr, the last wife of Henry VIII, who continued to be known as Queen Catherine even after her marriage to The Lord Seymour of Sudeley (and, indeed, she disputed precedence with the wife of her brother-in-law the Duke of Somerset on this basis). This usage died out later in the twentieth century, and women who remarry now ordinarily take a new married name and do not retain their former title. On 21 August 1996 letters patent changed titles of divorced wives of British princes, depriving their former wives of the style of Royal Highness. For this reason Her Royal Highness The Princess of Wales after divorce became Diana, Princess of Wales. The same happened to Her Royal Highness The Duchess of York who became Sarah, Duchess of York. If a peer or knight enters into a civil partnership, his or her partner is not entitled to a courtesy title. Laird is a courtesy title which applies to the owner of certain long-established Scottish estates; the title being attached to the estate. Traditionally, a laird is formally styled in the manner evident on the 1730 tombstone in a Scottish churchyard. It reads: "The Much Honoured [Forename (John)] [Surname (Grant)] Laird of [Lairdship (Glenmoriston)]". The section titled Scottish Feudal Baronies in Debrett's states that the use of the prefix "The Much Hon." is "correct", but that "most lairds prefer the unadorned name and territorial designation". The wife of a Laird is traditionally accorded the courtesy title of Lady. A form of courtesy title granted is the suffix of "The Younger" (also written as Yr or yr) at the end of the name. This title is granted to the Heir Apparent of a Laird (Lord) and is placed at the end of his or her name (example - Mr John Smith of Edinburgh, Younger). The wife of a Younger may herself place the title at the end of her name. The holder is addressed as the younger (example - The Younger of Edinburgh). The courtesy prefix of "Maid" is granted to the eldest daughter of a Laird (Lord). If the eldest daughter is also the heir presumptive she may either hold the title "Younger" or the title "Maid". The title is customary and not automatically given. The title is placed at the end of the name (example - Miss Ali Joy, Maid of Newcastle). The holder is addressed as "The Maid of Lairdship". The courtesy titles and styles of children of peers are social, not legal. For this reason, in official documents, Lord John Smith is often referred to as John Smith, Esq., commonly called Lord John Smith; The Hon. Mrs Smith would be called Mary Jane, Mrs Smith, commonly called The Hon. Mary Jane Smith. Only peers in attendance at Parliament enjoy statutory precedence. There is, however, official precedence accorded at the Court of St James's that results from being the wife or child of a peer, and to which social styles are attached. The wives of peers, however, are peeresses and legally enjoy their titles in exactly the same manner as peeresses in their own right. Children of peers can outrank certain actual peers. For instance, the daughter of a duke outranks a countess. However, if the daughter of a duke marries an earl, she drops to the rank of countess, because her courtesy title is subsumed in his substantive title. But, if that same daughter marries a commoner, she retains her rank. If that daughter marries the eldest son of an earl, though he may be a courtesy peer, she may keep her rank until the son inherits the earldom, when she must drop to the rank of countess. Following the creation of the Supreme Court of the United Kingdom, the first Justices of that Court held life peerages, and continued to hold them. However, the Government has announced that future appointees will not be created peers, and the first non-peer appointed to the Court was Sir John Dyson. In order to avoid any distinction between the Scottish Justices of the Court (who receive a judicial title), by Royal Warrant dated 10 December 2010 all Justices of the Supreme Court not holding a peerage are entitled to a judicial title, and retain the style (a courtesy title) for life. Thus, Sir John Dyson is now styled as Lord Dyson (instead of The Lord Dyson). Wives of male justices not holding a peerage are styled as if they were wives of peers. In Scotland, Senators of the College of Justice (judges who sit in the Court of Session) use the title Lord or Lady along with a surname or a territorial name. All Senators of the College have the honorific, The Honourable, before their titles, while those who are also Privy Counsellors or peers have the honorific, The Right Honourable. Senators are made Privy Counsellors upon promotion to the Inner House. For example, Alexander Wylie is known as The Honourable Lord Kinclaven, whilst Ronald Mackay is known as The Right Honourable Lord Eassie. Some Senators also hold peerage titles, such as The Rt Hon. The Lady Clark of Calton, and these would be used in place of judicial titles. The title of "Doctor" (or the abbreviation "Dr") is used as a courtesy title in a number of fields by professionals who do not hold doctoral degrees. It is commonly used in this manner by qualified medical practitioners (except surgeons) and by qualified dentists. The Royal College of Veterinary Surgeons also allows the use of "Doctor" as a courtesy title by its members. The title of Captain is used as a courtesy title by shipmasters in the merchant navy who do not hold the military rank of captain. It is also used in oral address for naval officers below the rank of captain who are in command of a ship. ^ Elliott, George (1816). The Life of the Most Noble Arthur, Duke of Wellington. London: J. Cundee. p. xiii–xiv. ^ "No. 57306". The London Gazette. 2 June 2004. p. 6821. ^ See: Adoption Act 1976, section 44(1) and Adoption and Children Act 2002, chapter 4, section 71(1). "An adoption does not affect the descent of any peerage or dignity or title of honour." ^ "No. 56937". The London Gazette. 16 May 2003. p. 6081. ^ Bloomsbury Publishing (2016). "Scottish Clans and Territorial Houses". Titles and Forms of Address: A Guide to Correct Use. Bloomsbury Publishing – April 2016. Retrieved 1 August 2016. ^ "Divorced Peeresses Titles" (PDF). The New York Times. New York. 31 July 1901. Retrieved 6 July 2013. ^ "Showbiz Tonight". CNN.com. 20 December 2005. Retrieved 26 December 2012. The Queen herself knighted Sir Elton John, so his new bride would normally be called a lady. Would David Furnish be called Laddie? No chance, says the palace. It called the question 'interesting,' but passed the buck to the government. ^ Titles and Forms of Address. Bloomsbury Publishing. 31 January 2007. ISBN 9781408148129. Retrieved 26 January 2016. The widow of a chief or laird continues to use the territorial style and the prefix Dowager may be used in the same circumstances ... In rural Scotland (laird's) wives are often styled Lady, though not legally except in the case of the wives of chiefs. ^ Rogers, Charles (1872). "Monuments and Monumental Inscriptions in Scotland, Volume 2 – Parish of Urquhart and Glenmoriston". Grampian Club. p. 383. Retrieved 26 January 2015. ^ "The Convention of The Baronage of Scotland: Male Heir". scotsbarons.org. Retrieved 16 September 2018. ^ "Scottish Feudal Baronies". debretts.com. Retrieved 11 February 2016. ^ "Courtesy titles for Justices of the Supreme Court" (PDF). The Supreme Court of the United Kingdom. 13 December 2010. Retrieved 26 December 2012. ^ "Doctor". Oxford Reference. Oxford University Press. Retrieved 15 May 2017. ^ "UK veterinary surgeons to use courtesy 'Doctor' title" (Press release). Royal College of Veterinary Surgeons. 6 March 2015. Retrieved 15 May 2017. ^ "The Courtesy Title of "Captain"". International Federation of Shipmasters' Associations. Retrieved 27 June 2017. ^ "Captain". Encyclopedia Britannica. Retrieved 27 June 2017.